Ah summer – perfect for enjoying a nice afternoon out on your vinyl deck with friends and family. The problem is that eventually summer fades, and few people think about their vinyl decks in the rainy months, or when the snow is melting. 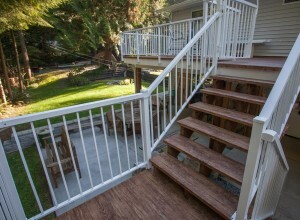 Come next spring you might then be in for a nasty surprise of a leaky deck once it becomes time to get outside. Regardless of deck material, the underlying structure composition, or the railing material, all deck and building materials have a lifespan. Of course, there are ways to extend the lifespan so you get more out of your vinyl deck. The first key is regular maintenance to clear debris and keep the surface clean – at least twice per year in the fall and spring. For vinyl decks above the main floor, it’s vital that water is drained away correctly to avoid causing water damage to the structure underneath. Check that your vinyl deck surface is sloping water away from the structure, and ensure that drained water is leading away from your home. Standing water on your vinyl deck surface is not a good thing – it provides the opportunity for water to find its way under the vinyl membrane or into the building envelope. If you have any doubt as to whether a vinyl decking surface was installed correctly, have it checked out immediately. The quality of a vinyl membrane, as well as installation practices, have changed over time. Your older vinyl deck might not meet current building codes and could be deteriorating. Buying a home with an existing vinyl deck should rate an inspection – the last thing you want is to find that it’s leaking or could leak in the near future. Some issues can be resolved with a little TLC, without having to replace the whole deck, but an inspection could find further issues. Obviously, leaks are less of a concern in the summer months when there is less rain (unless you live in a semi-rainforest area like Vancouver or Seattle) – but you should definitely get a replacement before the coming fall. Contact a Tufdek™ vinyl deck professional to get the ball rolling.